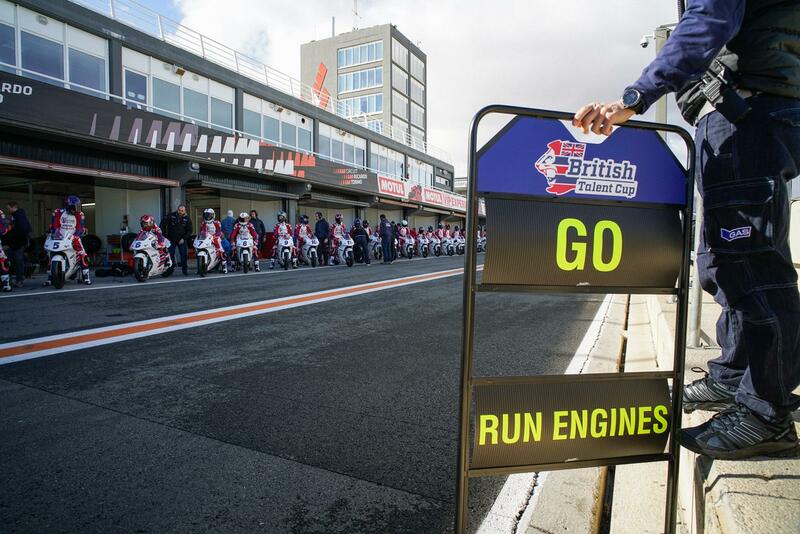 Former Red Bull Rookie Cup frontrunner Rory Skinner has topped the opening test for the new British Talent Cup series at Valencia, with the Scottish teenager’s speed coming as no surprise given his experience with the Spanish circuit thanks to his experience in both the Rookies series and the Junior Moto3 world championship there. He finished the two days two tenths of a second clear of Brian Hart, with Storm Stacey a further tenth back on their first run out on the one-make series’ Honda NSF250R. Not originally a qualifier for the series at the selection event back in August at Silverstone, Skinner was nonetheless offered a place in the class after his Junior Moto3 ride fell through. Behind the top three, Fenton Seabright ended the test in fourth, with less than a tenth back to Jamie Davis, who completed the top five. Joshua Whatley, one of the youngest in the field, was sixth overall – 0.040 off Davis – with seventh fastest rider Charlie Atkins even closer, with a deficit of only 0.004 to Whatley. Max Cook, Thomas Strudwick and Irishman Rhys Irwin completed the top ten. The first round of the series will run alongside the opening round of the 2018 British Superbike championship at Donington Park on Easter weekend.